Adolescence is a distinct period of development that presents a number of special challenges. This fact has important implications for professionals selecting and administering assessment procedures and interpreting the data they yield, yet assessment texts have focused on adults or children and devoted minimal attention to adolescents. 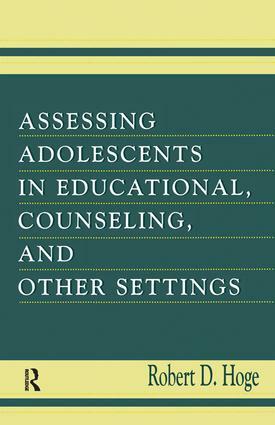 This book constitutes the first up-to-date and practical guide to the effective psychological assessment of adolescents. Throughout, the author's emphasis is on standardized instruments. Their use, he argues, provides more valid information about individuals, leads to better treatment or placement decisions, and contributes to the more efficient management of organizational resources than does reliance on clinical interviews and judgment alone. Assessing Adolescents in Educational, Counseling, and Other Settings will be welcomed by all those professionally involved in the assessment of adolescents--psychologists, psychiatrists, social workers, child care agency staff, and educators--as well as by those who must make decisions based on their assessments--school principals, youth court judges, and managers of residential treatment facilities among others. Developmental researchers will also find this review of available standardized tools helpful in their work.